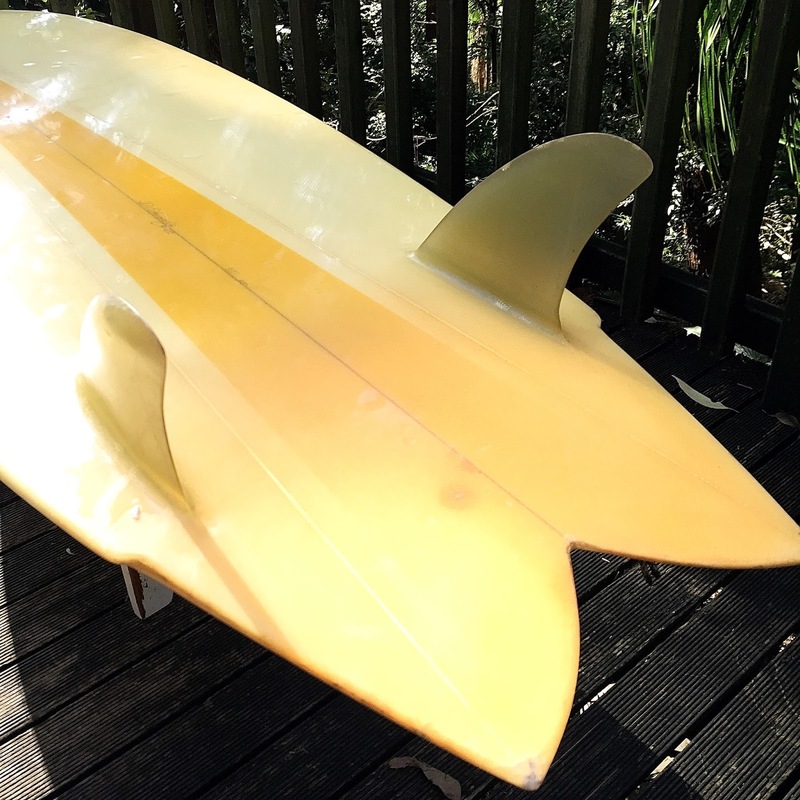 : Board Collector: Natural Progression twin fin fish. 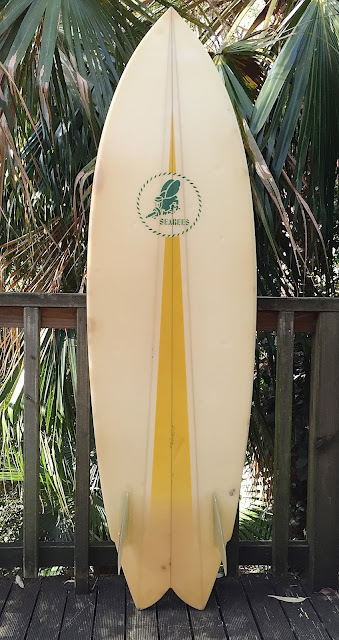 I'm pleased to share with you my 6'4" US made Natural Progression twin fin fish from 1981. It was shaped by Dean Edwards, who began shaping in the late ‘60’s with Wilken before moving to Natural Progression in Malibu. For the last 25 years he has been based on the Big Island of Hawai’i. 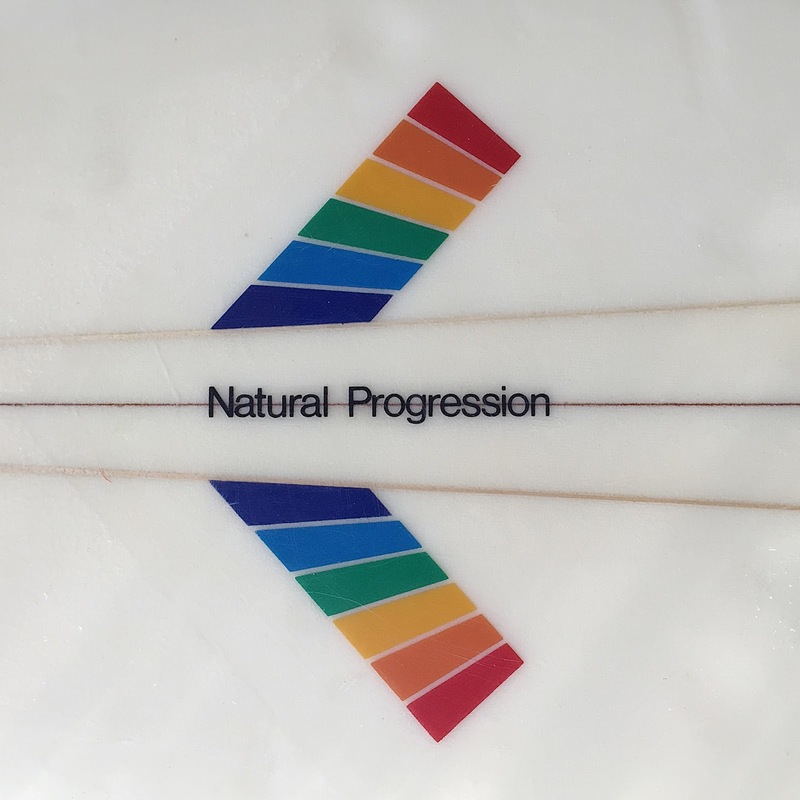 The board has a beautiful triple stringer, made up of 3 separate foam panels with a pair of very nice fluted flyers. 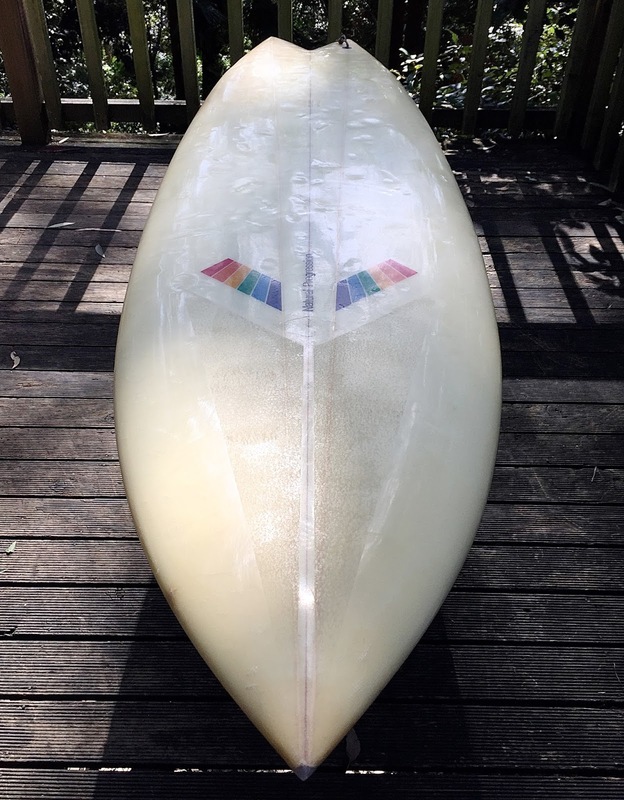 I do admire the 70's modernist design decal. 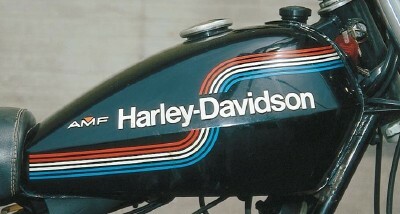 It reminds me a lot of the 70's Harley Davidson logo when they were owned by 10 pin bowling company AMF. 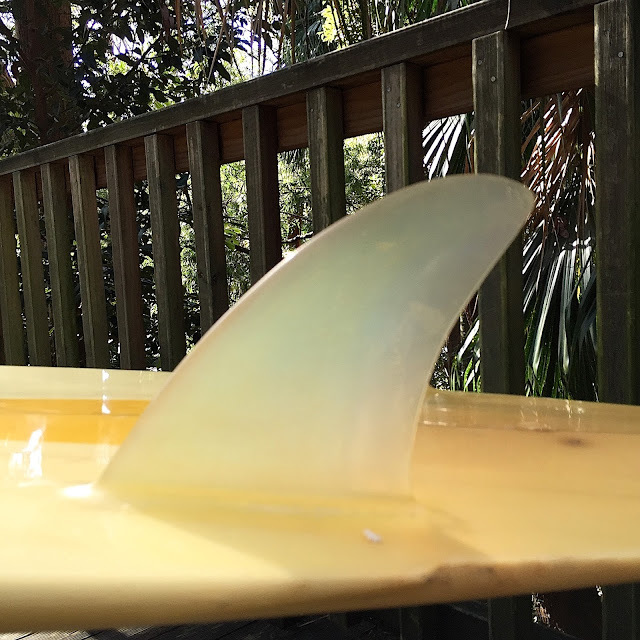 Full of volume under the chest. Single fly with very wide swallow tail. 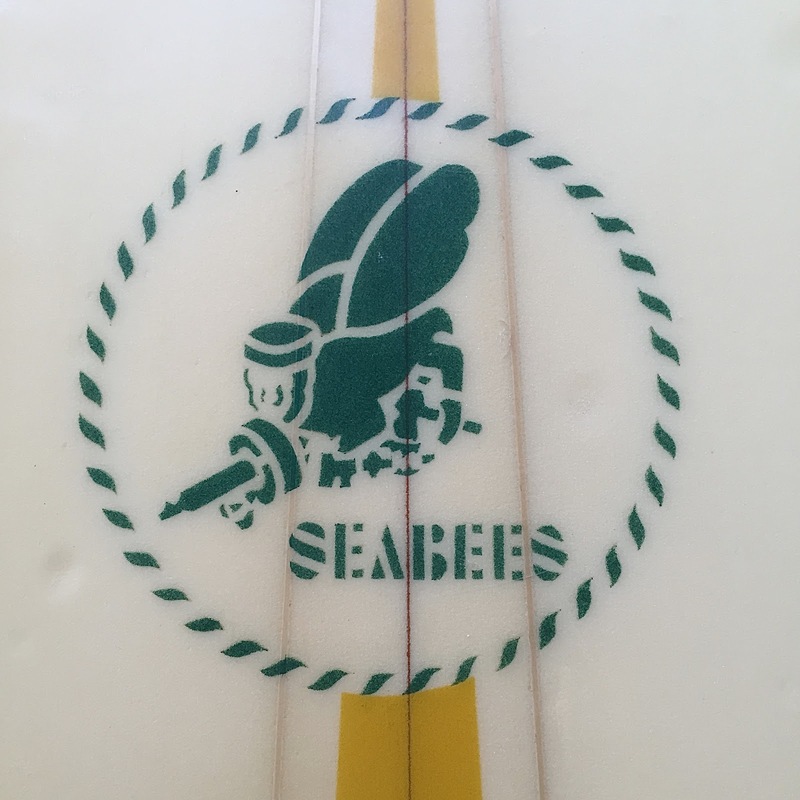 This board was a custom order for a Vietnam vet who was a member of the 'Seabees' and carries a hand cut stencil of the Seabees insignia. A Seabee is a member of the United States Naval Construction Forces. 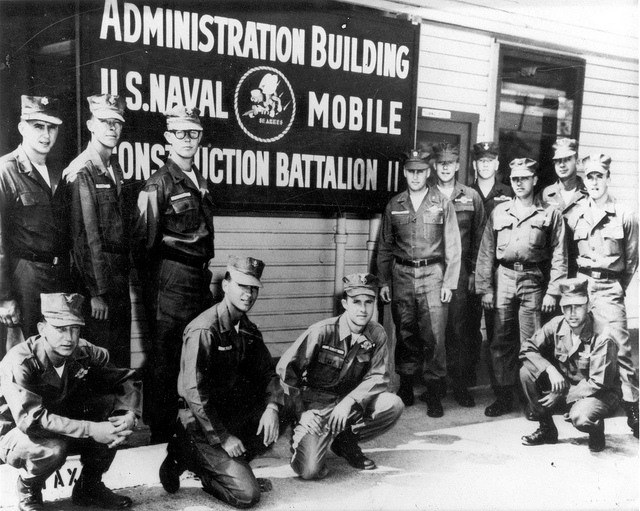 The word "Seabee" comes from initials "CB", which in turn comes from the term "Construction Battalion". 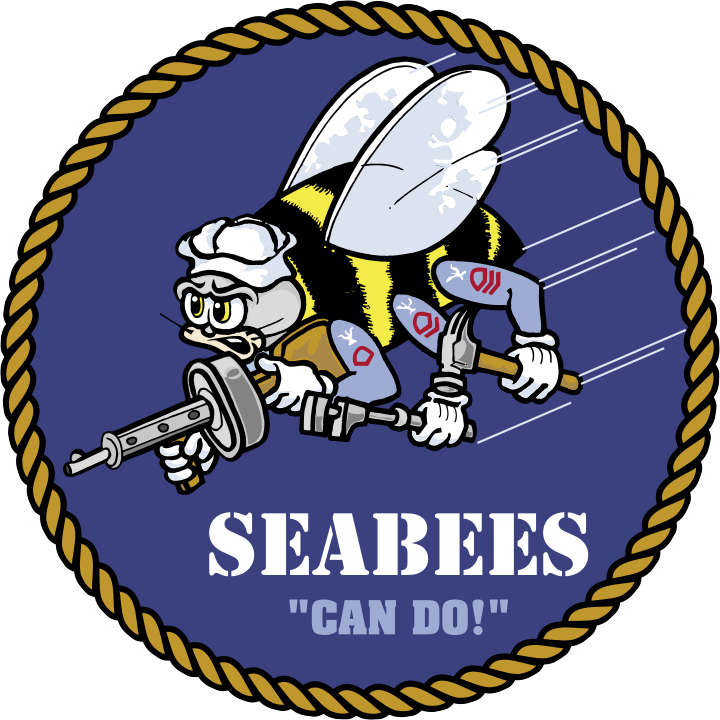 The Seabees have a history of building bases, roadway and airstrips, and accomplishing construction projects in a wide variety of military theaters dating back to World War II. 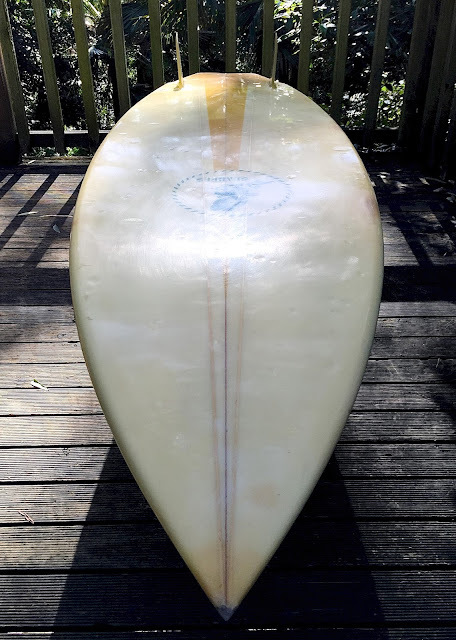 This is the first vintage board I've ever seen with the dimensions written out in metric rather than imperial format. 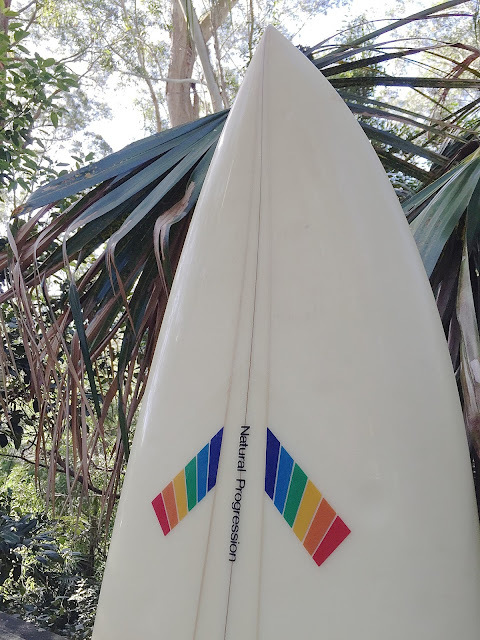 I've often thought it strange that surfboards are still measured in feet and inches, especially in Australia where we have been cleverly and effectively using the metric system since 1966. I find it stranger still the the US is still so dedicated to using the imperial system of measurements. 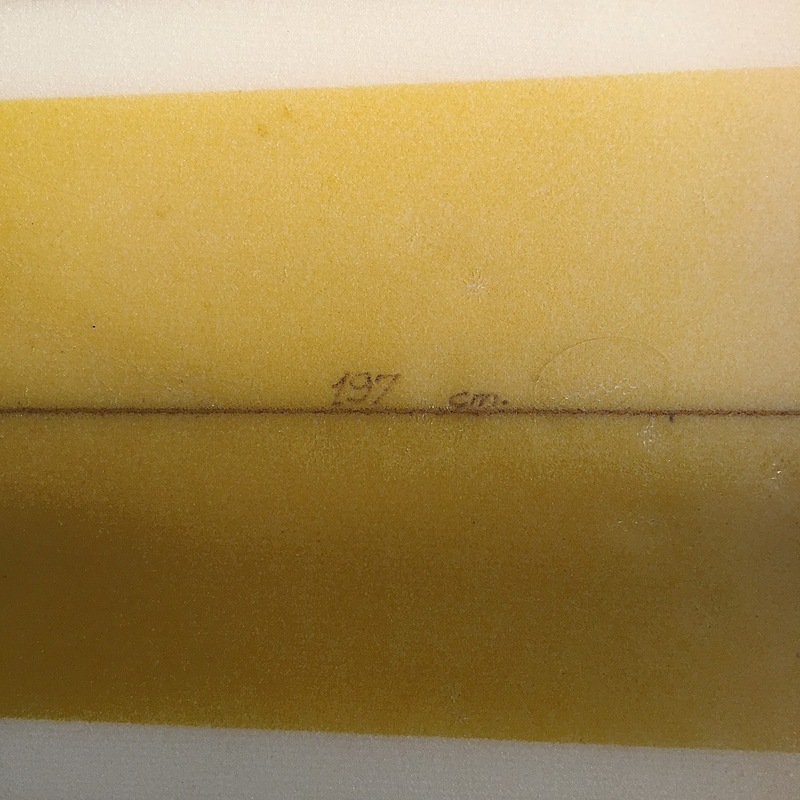 A foot was originally set as a standard of measure based on the length of the King of England's actual smelly old foot. One would think the first thing the American's would change after going to all the trouble of winning a war of independence would be to stop using the King of England's body part in their everyday life. As a side note, its interesting that even the English don't use this complicated and out dated system of measurement. 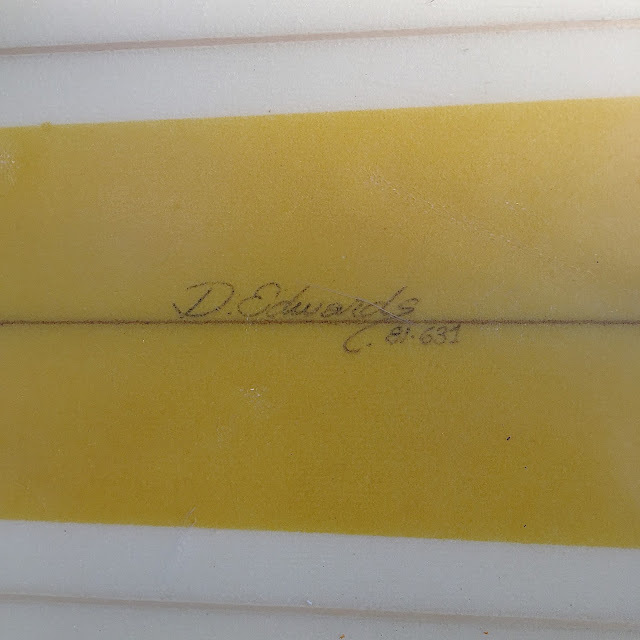 It seems old Dean Edward's was ahead of his time. 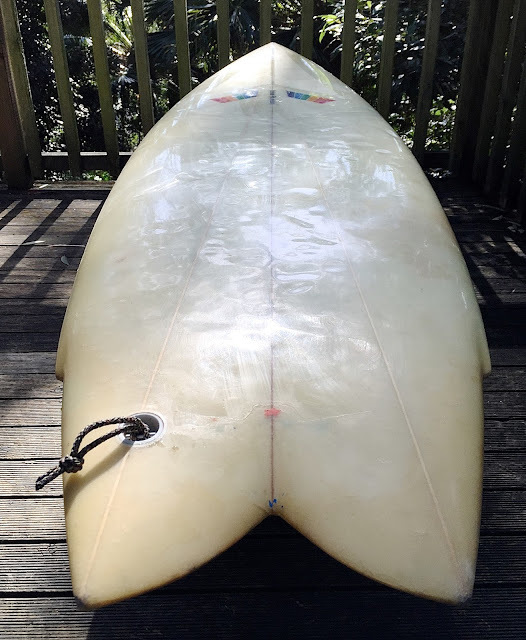 The board is very simple and flat through the bottom with only a slight fee in the tail. Interesting twin fin template that I have found to be unique to southern California. Reminds me of the "new" Dane Reynolds "Sampler" board the way the tail is pulled in sharply.